The Madara Rider sits 246 feet above ground, on a cliff face in the Madara Plateau of northeastern Bulgaria. The relief is inaccessible, adding to its mystery. How were they able to create it? 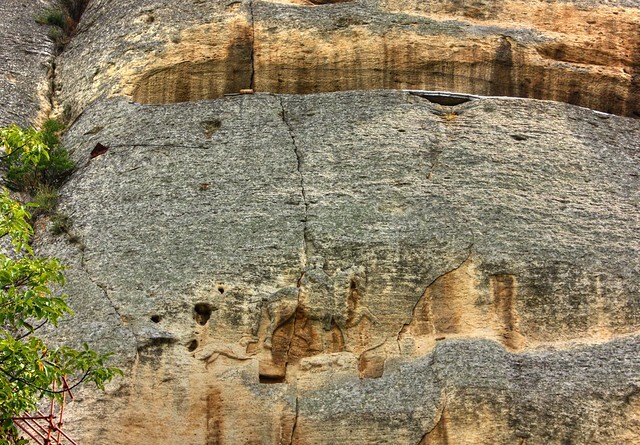 Including the inscription in Medieval Greek, the rider covers close to 1400 square feet on a vertical 328 foot cliff face. The horseman is depicted in a hunting scene, spearing a lion. The lion is being trampled by the horse and a dog is trailing behind the rider. The Greek inscriptions tell the history of the Bulgarian state and the three Khans including Tervel, Krum and Omurtag . Professor and Bulgarian Historian Veselin Beshevliev translated all three inscriptions in his book Protobulgarians. Beshevkiev , being a devoted decoder of Medieval Greek, also translated the Presian Inscription inscribed upon a stone in Philippi during the reign of the Bulgarian ruler Presian I.
Madara Rider is a monument, loved by all Bulgarians, created to embody the victory of the Bulgars over Byzantium. The nomadic tribe of Bulgars was victorious in battle against Byzantium in 681. The Bulgarian state was established by the Slavs, and then recognized by the Byzantine Empire. The iconic symbol of the Madara Rider, carved thirty years later, was in celebration of the victory. Who is the Madara Rider? Khan Tervel, chosen as the new head of the Bulgarian state, is believed to be the horseman. This can’t be confirmed, even by scholars; however the victorious leader would be most deserving of such an honor. The carving was completed by an unknown artist and an inscription exists in Medieval Greek, some say it's the work of Tervel himself, created during his rule. 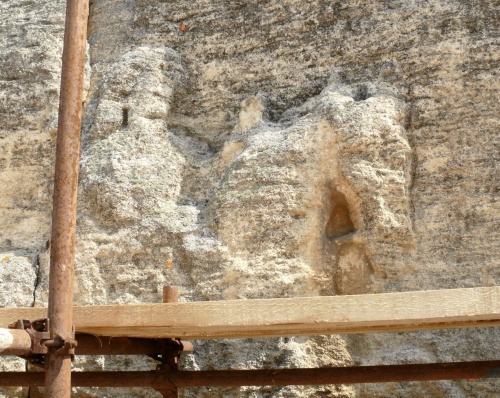 Some Archaeologists connect the stone relief with the ancient Thracians, claiming it portrays a Thracian god. This hypothesis can’t be confirmed, and furthermore, there’s no evidence or data to support it. Can visitors tour the archaeological site at Madara? Yes, they can. In fact, not only can visitors glance upon the Madara Rider, but they can tour the caves at the foot of the cliffs where religious practices took place. Madara served as a major site of pagan worship after the First Bulgarian state was formed. The relief is a monument to the victorious Bulgarians and serves as one of the only carved monuments in stone, not to be paralleled by another in the cultural history of Europe. The horseman, however, after 2000 years has started to erode. I fear the natural elements and earth tremors will eventually chip away an important piece of archaeological history.